2016 is the Year of the Monkey, plenty of which can be found up in the Minoh mountains, not too far from my apartment. One of the most famous monkey watching spots in the area is Minoh Falls, where the monkeys tend to come out at dusk to pick the mites out of each other’s fur. The monkeys are very clever and there are even rumors that they’ve figured out how to put spare change in the vending machines and then punch the buttons to extricate a variety of tasty treats. I once watched one clever monkey sidle up behind a guy who was walking up the path swinging his sack lunch by his side. The monkey matched his stride perfectly for about three meters — it was almost as if the monkey was performing a kind of vaudevillian impersonation in miniature — and then quickly reached out, grabbed the sack lunch, and made off into the foliage. That was the skilled pilfering of a practiced master. 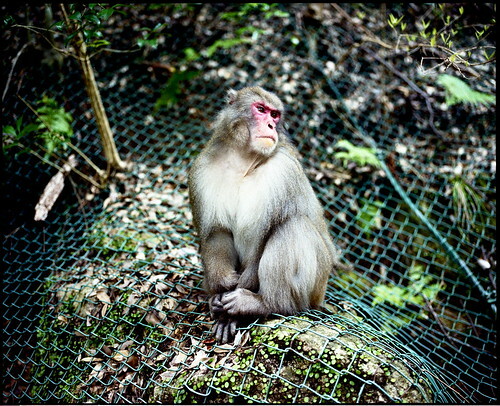 I’ve been hiking up in Minoh countless times, but I’ve only gotten a few decent photographs of the local simian inhabitants, the one at the top of this page being my very favorite. And I have to thank the monkey in question — a Japanese macaque (Macaca fuscata) — for holding still so patiently while I was busy pulling focus. Perhaps the most famous monkey in literature is Sun Wukong, the Monkey King, one of the protagonists of the classical Chinese novel, Journey to the West. Journey to the West is essentially the story of the Tang Dynasty monk Xuanzang, who journeys to India in order to bring back a set of sutras, the sacred texts of Buddhism. In the novel, Xuanzang is accompanied on his journey by three disciples: Sun Wukong, Zhu Wuneng (a pig), and Sha Wujing (a very slow-witted character that is perhaps modeled after a water buffalo). 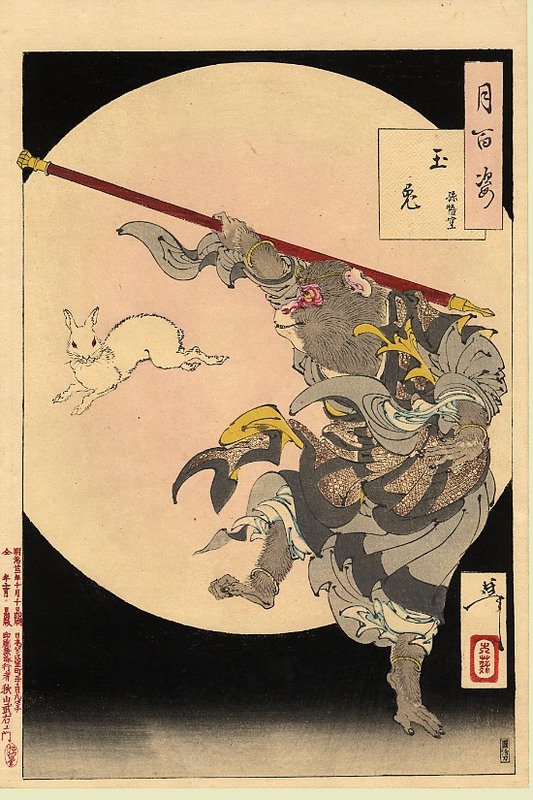 The novel’s fictional account of the spread of Buddhism in East Asia clearly follows the pattern of the historical spread of Buddhism, but while Buddhism is an essential component of the story, it is the character of Sun Wukong — a trickster figure par extraordinaire — that explains its enduring popularity. According to the legend, Sun Wukong, or Monkey King, was born from a magic stone that sat on the top of a mountain, that had been receiving the powers of the heavens and the earth since the beginning of time and had thereby gained miraculous powers. The stone stood 36 feet and 5 inches representing the degrees of the heavens and 24 feet round representing the division of the solar calendar, with nine holes in it for the nine trigrams. The stone developed a magic womb, which burst open one day to produce a stone egg about the size of a ball. When the wind blew on this egg it turned into a stone monkey complete with the five senses and four limbs. When the stone monkey came out, he already had the ability to crawl and walk. He then bowed to each of the four quarters. As his eyes moved, two beams of golden light shot towards the Jade palace and startled the Supreme Heavenly Sage, the Greatly Compassionate Jade Emperor of the Azure Vault of Heaven, who was sitting surrounded by his immortal ministers on his throne in the Hall of Miraculous Mist in the Golden-gated Cloud Palace. When he saw the dazzling golden light he ordered Thousand-mile Eye and Wind-accompanying Ear to open the Southern Gate of Heaven and take a look. The two officers went out through the gate in obedience to the imperial command, and while one observed what was going on the other listened carefully. I have plenty of vague memories of watching this program dubbed into English on KTVU Channel 2 when I was a kid — perhaps on Bob Wilkins’s excellent Captain Cosmic show — and who knows what kind of addling this did to my preadolescent brain. Pleasing the gods and everyone and having fun must clearly be the theme of 2016, so to usher in the New Year I decided to please the gods by making a hatsumode visit to each of the shrines that are within easy walking distance of my apartment. In the early afternoon I visited Kasuga-jinja, a shrine very close to my first apartment in Japan where I’ve been doing my hatsumode for about a decade. I waited in line for about thirty minutes with a crowd of quietly happy families ushering in the New Year, eventually making my way up to the main hall of the shrine where I made a few non-denominational prayers. 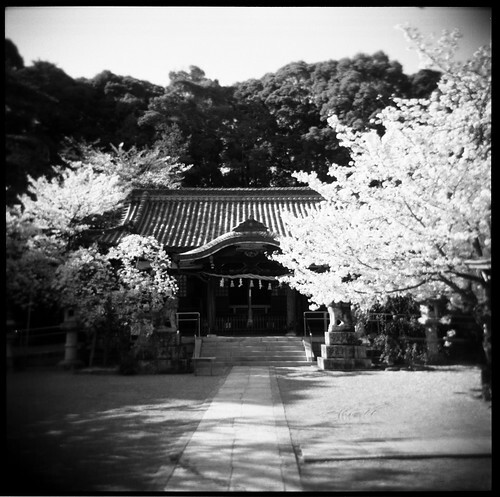 After paying my respects at the main hall, I walked up the hillside behind where there are numerous satellite shrines, making sure to spend a bit of extra time at the shrine building devoted to Michizane, the god of scholarship. As day turned to dusk I made my way to Toyonaka Inari-jinja, where the main hall was glowing persimmon-orange beneath the deep blue sky of early evening, and waited in line again to say a few night prayers. Off to the side of the line the shrine bonfire crackled and sent occasional streamers of sparks into the night sky. Inside the main hall, New Year’s offerings were piled high on low tables: pyramids of oranges, fat stacks of mochi rice cakes, and rows of sake bottles wrapped in delicate white paper. 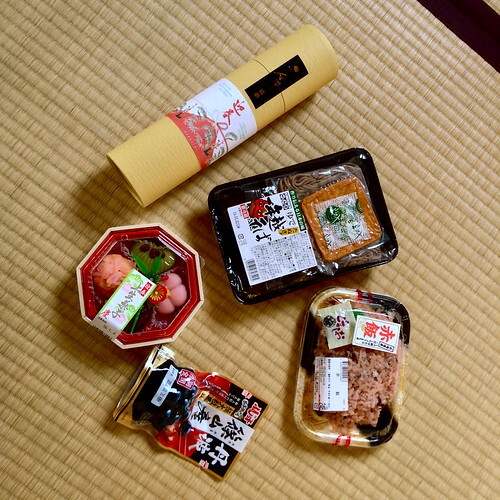 All kinds of foods that are specific to the New Year holiday are eaten in Japan, the most famous of which is the osechi-ryori eaten by Japanese families during the first few days of the year when everything is closed. Since I’m not a Japanese family, I had to make do with my own cobbled-together New Year feast — a veritable bachelor’s osechi. As 2015 handed the baton over to 2016 on New Year’s Eve, I ate a bowl of toshi-koshi soba and drank a couple of glasses of pure-rice sake (純米酒) infused with a drifty universe of gold flakes. Toshi-koshi soba symbolizes continuance and longevity (the noodles ‘cross over’ between one year and the next), while the gold flakes in the sake represent prosperity. The next day I ate my own homemade version of ozoni, a soup that includes fresh mochi, and I had plenty of sweet black beans, which represent seriousness in endeavor (the Japanese word for bean, mame (豆), is a homonym of the word mame (忠実), which denotes seriousness, diligence, faithfulness, and all those other good qualities). I also downed my share of sekihan (赤飯), a traditional red rice and bean dish eaten on auspicious occasions. And don’t forget the sweets — a selection of tasty-enough cheap supermarket daifuku (大福) in a variety of colorful, lucky, and dare I say — charming — shapes.